VS1 diamonds are among the top quality diamonds. It's the last clarity grade in which you can be sure there will be no visible flaws. This makes VS1 a trusted choice no matter what size or shape diamond you're thinking of. And because it falls under the "flawless" and "almost flawless" categories, it's also more affordable. Is it the best value though? Let's find out. VS1 diamonds are at the top of the "Very Slightly Included" range. This range means that there are slightly larger internal flaws or multiple smaller ones. They're slightly more easily seen under 10x magnification, but usually not to the naked eye. The difference between VS1 and VS2 is in the size, number, and placement of flaws. Most flaws are simply too tiny to be seen with the naked eye. In the VS range, it takes a professionally trained jeweler to spot them under 10x magnification. So (in most cases), the casual admirer will not see any flaws when looking at the diamond with the naked eye. 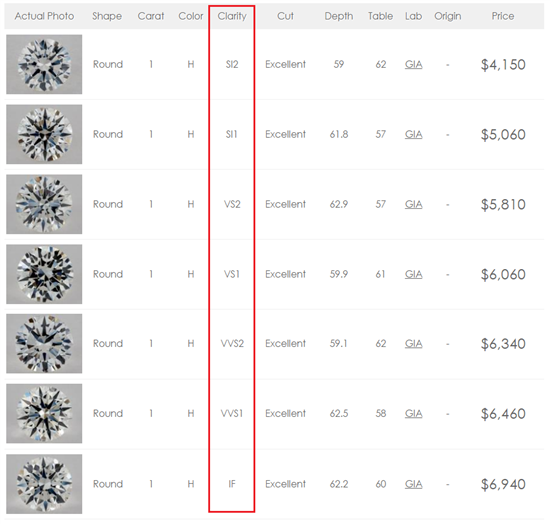 In a search for VS1 diamonds on James Allen, I did not find a single one with a visible flaw, even with magnified photos. 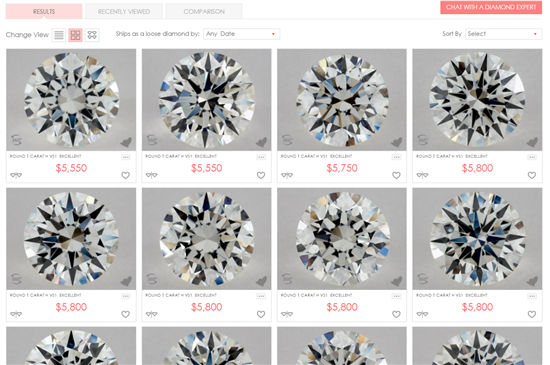 Across the board, it can be agreed that you will not see any flaws on a VS1 diamond (if the diamond has been graded by a reputable lab like GIA or AGS). Usually, we recommend VS2 diamonds as the best sweet spot between clarity and price. It's generally a safe bet that VS2 diamonds are eye-clean as well. And they can be a few hundred bucks less than VS1 (with all other factors being equal). If the diamond is larger. If you're getting a larger diamond (2-carat or more), you'd want to pony up for a VS1 clarity grade. Larger diamonds have larger facets, making it easier to spot flaws. If you're buying a step cut diamond. Brilliant cut diamonds do a fantastic job of hiding imperfections with their superior light reflection. But step cuts, like emerald or asscher, have a large open window straight into the depth of the rock. So flaws are much more visible. Sometimes you can see flaws on a VS2 diamond. With VS1, though, the flaws are still minor enough that you won't see them. VS1 diamonds are pretty much guaranteed to be eye-clean no matter what size or shape diamond you choose. So if you're ordering the diamond online and feel really unsure, it's a safe choice. A VS1 diamond is a good value for a high-quality diamond that you can trust will have no visible flaws. But if you're looking for the absolute best value, in our opinion, VS1 diamonds do not represent the best value. Most VS2 diamonds are also eye-clean. And you can even find eye-clean SI1 and SI2 diamonds. And check out the eye-clean I1 diamonds we've found too! So if you can find eye-clean diamonds at a lower grade, there's no point spending more on a higher clarity when the diamonds appear the same to the naked eye. As you can see, you can save quite a bit if you can find an eye-clean VS2 or SI diamond. But like we said, there are some cases where we do recommend VS1 as the lowest grade you want to go. Tip: To find eye-clean VS2 or SI diamonds, you will need to actually examine them yourself. 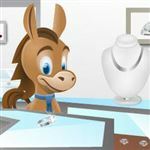 If you're shopping online, our top recommended diamond retailer is James Allen, which has HD 360-degree videos for every diamond in their collection. So you can view diamonds from all angles and see what kind of flaws you see. Whiteflash (known for super ideal cut diamonds) labels their diamonds as eye-clean if their experts have examined them to be so. Make sure the diamond is certified by a reputable lab. To us, this means only GIA or AGS. These are the two most reputable labs with the highest grading standards. Another lab may grade the diamond as VS1 and be priced cheaper. But in reality, the diamond could be graded as SI1 by GIA. So you don't want to pay for something that only looks good on paper. For example, this diamond is graded as VS1, and it has a black flaw smack in the center right on the table facet. Clarity has nothing to do with brilliance. A lot of people make this mistake. 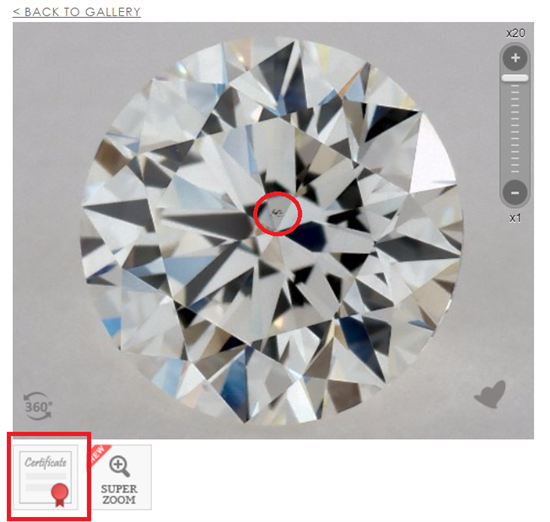 They think a high clarity grade means that the diamond will be more sparkly. But in fact, cut is the only factor that determines how brilliant the diamond will be. If the cut is poor, even the most flawless diamond will look dull. So still make sure you get a well-cut diamond. Cut is the area where the extra money has the largest impact on beauty. The color of the diamond makes more of a visible impact. Personally, we think color is more important. A diamond high in clarity but low in color will appear less beautiful than a whiter diamond with larger flaws. There's not much to pick on with VS1 diamonds. 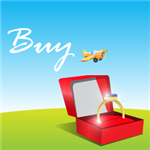 They are high quality and still offer a more affordable option to those looking for an almost perfect diamond. They are a safe choice and are guaranteed to be eye clean. Just make sure the diamond was graded by GIA or AGS. But if your goal is to just get an eye-clean diamond, you can find one with lower clarity ratings and save a good chunk of money. Leave a comment about VS1 Diamond: Best for 100% Eye-Clean Diamonds?